I noticed my passenger side window needs about 1/2 inch up, I have to take it in. It is under warranty so I am sure they will, I have make an appointment. Depends on what warranty its covered by. Adjustments/etc are 1/12k. 5/60 is if things are "broken"
Hmm. I get the same wind noise problem from the driver's side but I'm not sure what the cause is really. I'm guessing it's an insulation problem but it doesn't bother me enough to get it checked out. Sorry for bumping old thread, but how to DIY this issue with the driver side window not going up all the way against the seal? Its the mirror like others have stated (at least for me it was). I first starting getting a creaking sound when it was warm outside from what sounded like the top corner of the drivers side door pannel with a few thousand miles on the car.. and then shortly after I started getting the wind noise at highway speeds. I too took the mirror off and readjusted it, helped both issues. Whoa.. just realized how old this thread was.. dont hate me. Amazing this thread started in 2013. I have a 2017 Santa Fe and have had it to 2 different dealers because the wind noise on the drivers door is so bad. After the 4th visit they said it was probably due to the mirror. No air leaking in (per a test) so nothing they can do. Clearly Hyundai is aware of this problem and chooses to ignore. I love the car but will not purchase another or recommend to anyone. Angry that they haven’t been honest about this. I bought a leftover 2016 "Ultimate" 6MT in Oct 2016. There was a very noticeable and annoying wind whistle from the driver's door window, but I figured "no problem, the dealer will fix it under warranty". After 5 trips to the selling dealer (1.75 hours from home - got a great deal), they gave up and said they didn't hear the noise. "Don't you have a dealer closer to home?" they said to me at my final visit. I lived the horrible noise until this past fall, when I reluctantly took the car to my local dealer for another issue. 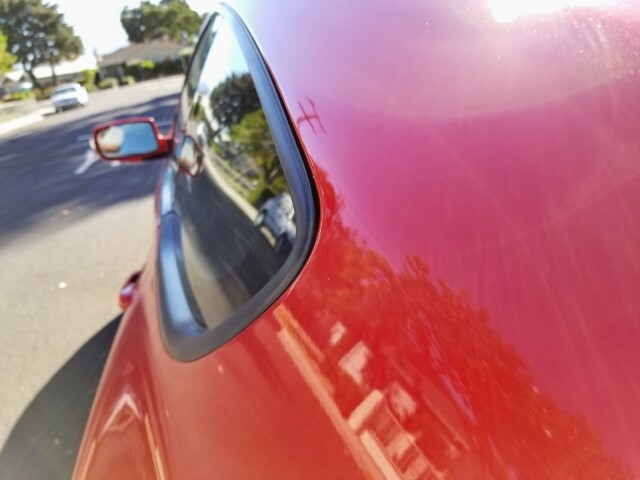 I was pleasantly surprised they diagnosed the wind noise problem right away ("outer door belt molding" - the horizontal seal with rubber squeegee against glass) and fixed it under warranty. I've since had it back there for a few other things. Towne Hyundai, Denville, NJ. They're a bit sloppy (grease on steering wheel, damaged license plate from their car wash, etc. ), but they seem to have some talented technicians. it's how the window catches the seal. It's a lip, that's why the goes down slightly when it's opened. The lip causes turbulence, turbulence translates to wind noise. I'm not sure we're talking about the same part. The selling dealer replaced all the perimeter door seals - twice - which did nothing. They also fiddled with adjusting the window's upper travel limit, to try to have it seat further up into the top seal. That too did nothing, but make the door difficult to open or close with the window in the fully raised position. It was the horizontal piece on the top/outside of the door. That's why I thought it was important to share this with the group. It wasn't intuitive, but I'm very happy it was fixed! You mean the bottom window seal, on top of the door sheet metal? Yes, that's the part. If my receipt for the repair showed the part number, I would provide it. It made a *huge* and welcome difference in the noise level. Previously, the window whistled like a tea kettle, now quiet. And they did a perfect job of adjusting the window's travel. The window now drops/raises with precision (even better than the passenger side, which was never a problem). that seal is usual an issue on most car the rubber gets old and shrinks, and the metal clips that hold it on lose their grip. Good timing. I am glad to see this zombie thread revived! I have the drivers side whistle (2016 3.8 Ultimate). It starts up at about 45-50mph. I don't remember it happening when I 1st got the car. I was going to start taping over things to try and narrow down where it was coming from. I'll check the mirror and the horizontal molding on the top of the frame. I had a driver's side wind noise a few months ago. Just suddenly started one day. Seems like it was above my head and right behind me but taping up the door window didn't help. So I crawled in the back seat (man, it's pretty tight back there!) and had my wife drive down the freeway. It sounded like either the top of the rear windshield or the back of the quarter glass. Got out to put tape on and instantly noticed that the quarter window molding wasn't flush with the body at the very back of the glass. No idea what caused that, the studs were tight and the sealer for the glass was still intact. Turns out that rubber/plastic molding is part of the glass so the fix is to replace the whole glass. Looking at it after I removed it, it's still not clear what happened. I had this issue with mine and just want to thank OP for the write up. Ended up being the window threshold seal for me. I think I was able to get it to seal properly yesterday, but did it after I was done driving around, so won't actually find out until later. I had the same issue with my Tiburon so I was almost ready to accept that frameless windows made noise. Haha! In order to be able to post messages on the Hyundai Genesis Forum forums, you must first register.